Oatmeal: it’s what’s for breakfast! Did you know January is National Oatmeal Month? Well it is! And it seems fitting since in my eyes oatmeal is a great breakfast treat or snack during the cooler days of the year. Oatmeal is one thing that I use not just to tame my morning tummy grumbles, but is great to use in lieu of breadcrumbs in meatballs, or as breading for chicken, and of course in cookies! But because it is a pantry staple, healthy, and inexpensive (way cheaper than boxed cereal) oatmeal is a breakfast option I choose often. To celebrate oatmeal month, I thought I would have an oatmeal themed week here on Kitchen Concoctions. (You know how much I love theme weeks!) This is not the first oatmeal theme week I have done, since last year’s was so fun and because I am on the life long quest to add as much flavor to bland oatmeal as possible, I thought I would do an oatmeal theme week repeat. Today’s recipe combines oatmeal with a delightful and classic dessert. 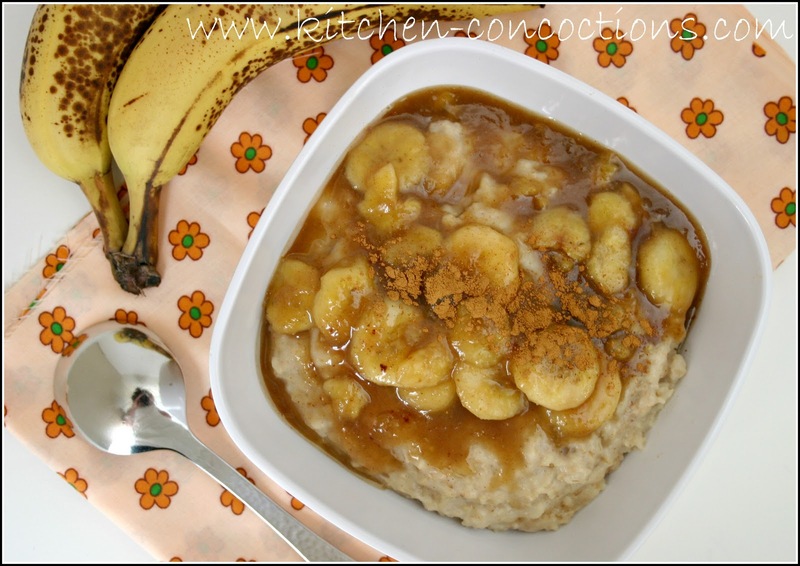 This Bananas Foster Oatmeal is a dessert that’s ok to eat for breakfast! The only thing that I think it is missing is a big scoop of vanilla ice cream! That is certainly a breakfast I can get on board with! Combine oats, milk, water, and vanilla and salt in a nonstick pot on the stove. Cook for 12 to 15 minutes, stirring occasionally, until very thick and creamy. Meanwhile, heat a small sauté pan over medium heat. Add butter and melt. Add sliced bananas to melted butter and cook for 1-2 minutes. Stir in brown sugar, cinnamon, and rum extract. Allow to cook for 1-2 minutes longer, until bananas are slightly soft and caramel sauce has formed. 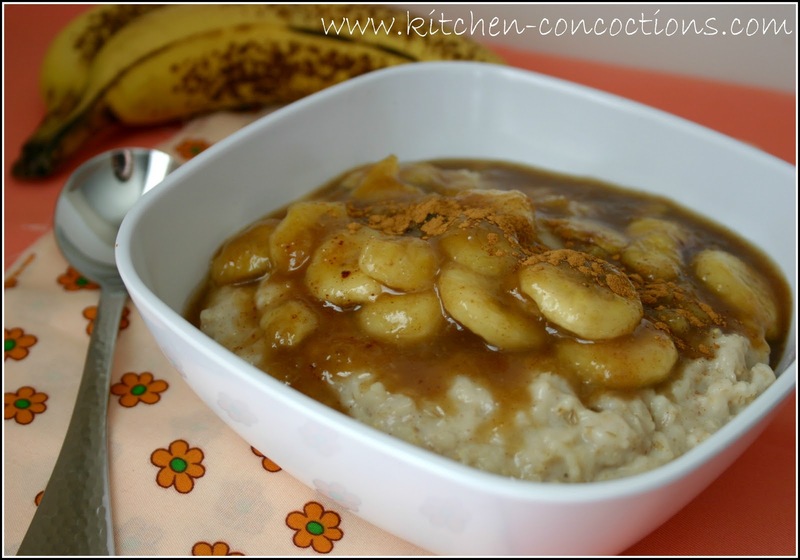 Pour bananas and sauce over prepared oatmeal. Serve topped with a dash of cinnamon, if desired. Hi Heather! I just noticed this recipe has no comments and that just hasn't right! I love this recipe and have made it countless times. I often leave out the rum extract, I don't keep it around. It's still so good. Thank you!